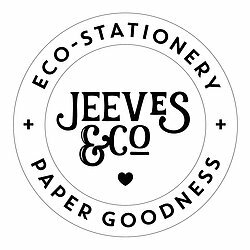 Original eco-stationery and Artwork made in Suffolk using recycled materials. 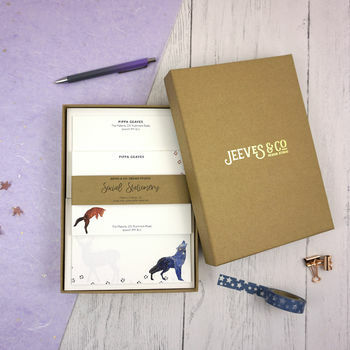 Jeeves & Co. Design Studio is an imaginative stationery brand based in the East of England, founded by award-winning designer, Pippa Geaves (pronounced ‘Jeeves’). Our designs are fully loaded with character, featuring stunning illustrations and beautiful colour palettes. Our eclectic range of designs and illustrations presents an exciting and unusual equilibrium between fun and refinement. 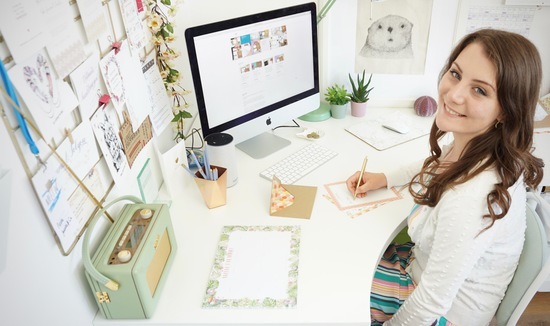 Our ethical principles are at the heart of all of our products and we strive to provide our customers with affordable, high-quality paper products made using recycled materials sourced within the UK. 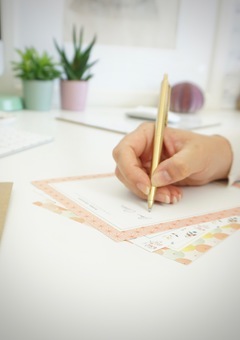 All of our social stationery, including our correspondence cards, writing paper and greeting cards, and our art prints too, are printed in-house and we offer a bespoke personalisation service on many of our products. 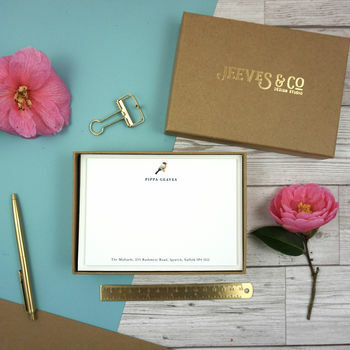 Let your imagination soar off the page with Jeeves & Co. Design Studio! 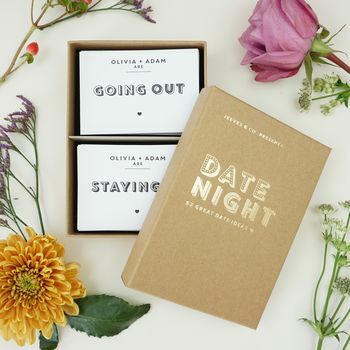 "Such a lovely idea and they look so professional and well put together. Very impressed! Arrived quickly too!" "Really gorgeous cards. They came so beautifully wrapped that I didn't want to open them! 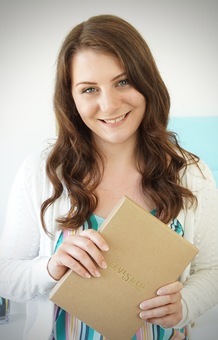 Very highly recommended"
"Beautifully presented and delivered a day earlier than expected. Perfect keepsake gift." 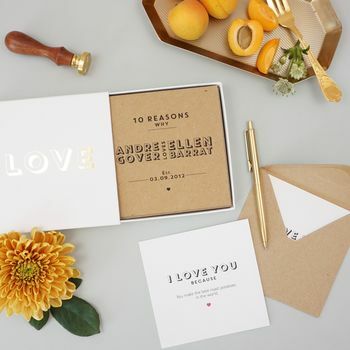 "Lovely packaging and the writing set is beautiful, bought as a gift but very pleased with it." Please note that the advertised delivery date is an estimation, not a guarentee. Though we try to ensure that all our parcels arrive by the estimated delivery date, this does depend on Royal Mail's 1st Class service which during busy periods can becoming slightly delayed. Royal Mail's 1st Class service typically takes 1-3 days to deliver within the UK. If you have not recieved your order four days after recieving your Dispatch Confirmation email, please contact us using the Contact Seller link. Please ensure when inputting personalisation information that the content, spelling and grammer are correct. Addresses provided for personalised social stationery should include commas between the street and city address (eg. 235 Rushmere Road, Ipswich, Suffolk IP4 3LU). 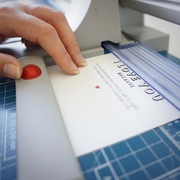 Any orders provided without the suitable puncutation will be altered to include commas, this is to ensure that the address is legible and understandable as a postal address. Personalised products are non-refundable and non-exchangable unless the item is considered faulty.